- a picture! with a companion! - have you written to paige? - letter - ciao tutti! - we found sister marchetti! - italian word of the week - ben venga! 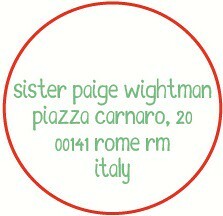 - first letter from italy - i made it! - letter - ask the missionaries ... they can help! jan - letter - you didn't tell me she has yellow hair! - letter - who did adam and eve's kids marry? - italian word of the week - guidami aiutami cammin insiem a me. - italian word of the week - potete sentirvi cosi ora? - letter - pasqua or pashqua? - rmtc - 6 weeks!!! - rmtc - 3 weeks!!! - rmtc - NEXT FFFRRIIDDAAYYY!! !